Camelon can move back into third place in the East of Scotland League Conference ‘C’ table with a victory at Jeanfield Swifts on Saturday. The Perth side are two points above Camelon in the table, with the Mariners currently having a game in hand. However, the chance for revenge on their rivals for third spot is bigger than actually finishing third for manager Gordon Herd. Herd also added that, while a win would be huge for Camelon in the race for third, a defeat would not rule them out of finishing there and this match isn’t quite in decider territory yet. 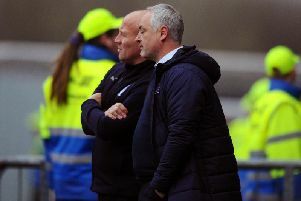 “I would probably say if we go up there and win that it would cement ourselves as third place but Jeanfield still have Linlithgow to play so that could have a baring on it,” he added. Camelon go into the match off the back of a cup victory in Fife –with the Mariners having seen of Crossgates Primrose with second half goals from Connor McMullen and Alan Docherty sealing the win despite a missed penalty from substitute Kieran Anderson. “We knew before the game that we would be going to a stuffy side,” Herd said. “But the boys dug in, won the battle and got two goals late on that we deserved. “Crossgates have had a good few scalps up there so the clean sheet was a good achievement as well. If you look at some of their results up there, they have beaten some good teams. Next round opposition is the winner of Musselburgh and Hill of Beath.